Jonathan Fore is an author of science fiction, fantasy, and dystopian novels. His latest work, Lexicon Chase and the kingdom of Everhope was launched to critical acclaim and won a Readers’ Favorite International Novel Award in 2016 in the category of Children, Social issues. Look for book 3 of the Everhope series, Lexicon Chase and the Sapphire Scales in bookstores soon! Also on the horizon for this author is the newly announce Allyson Best: Code Name Corn Flower, a new series of speculative fantasy spy novels. Look for Allyson Best, Stones in the Matrix in 2018. Jonathan enjoys hearing from fans or entertaining many publicity events. 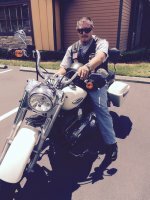 If you would like to interview Jon, invite him to be a guest blogger, or if you are in Orlando and want to go for a ride, don’t be hesitant to ask. If you would like to contact Jon, please use the form below.